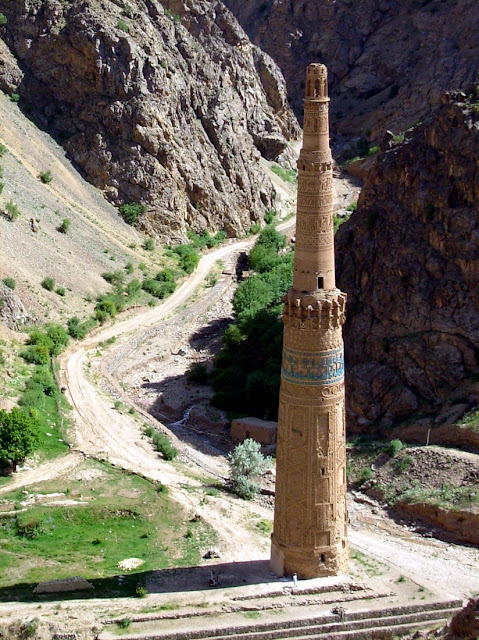 The Minaret and Archaeological Remains of Jam is a World Heritage Site in Afghanistan. 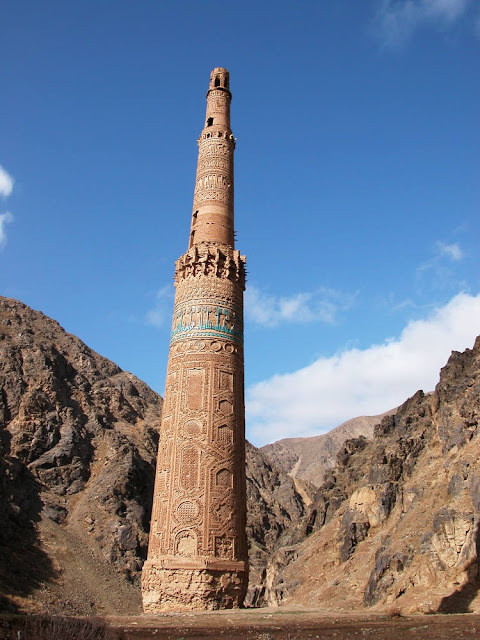 The 65m-tall Minaret of Jam is a graceful, soaring structure, dating back to the 12th century. Covered in elaborate brickwork with a blue tile inscription at the top, it is noteworthy for the quality of its architecture and decoration, which represent the culmination of an architectural and artistic tradition in this region. Its impact is heightened by its dramatic setting, a deep river valley between towering mountains in the heart of the Ghur province. 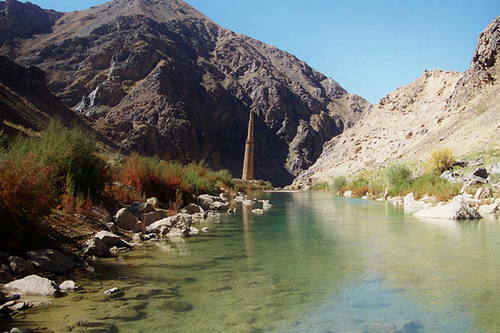 At 1,900 m above sea level and far from any town, the Minaret of Jam rises within a rugged valley along the Hari-rud River at its junction with the river Jam around 215km-east of Herat. Rising to 65m from a 9m diameter octagonal base, its four superimposed, tapering cylindrical shafts are constructed from fired bricks. 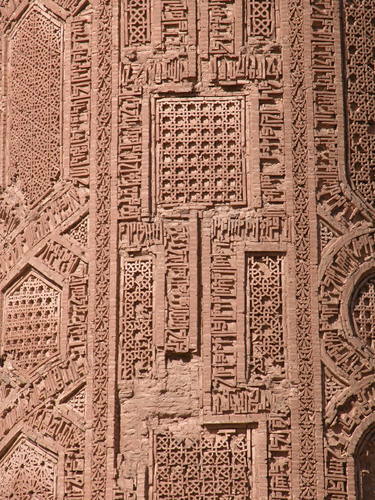 The Minaret is completely covered with geometric decoration in relief enhanced with a Kufic inscription in turquoise tiles. Built in 1194 by the great Ghurid Sultan Ghiyas-od-din (1153-1203), its emplacement probably marks the site of the ancient city of Firuzkuh, believed to have been the summer capital of the Ghurid dynasty. Surrounding remains include a group of stones with Hebrew inscriptions from the 11th to 12th centuries on the Kushkak hill, and vestiges of castles and towers of the Ghurid settlements on the banks of the Hari River as well as to the east of the Minaret. The Minaret of Jam is one of the few well-preserved monuments representing the exceptional artistic creativity and mastery of structural engineering of the time. Its architecture and ornamentation are outstanding from the point of view of art history, fusing together elements from earlier developments in the region in an exceptional way and exerting a strong influence on later architecture in the region. 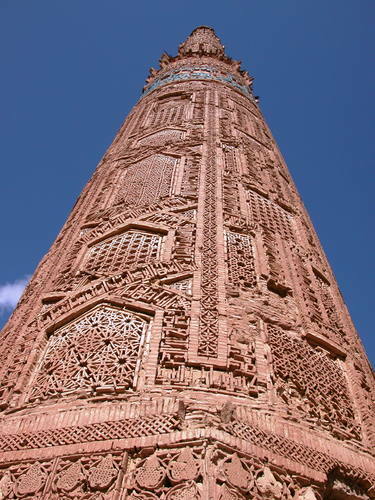 This graceful soaring structure is an outstanding example of the architecture and ornamentation of the Islamic period in Central Asia and played a significant role in their further dissemination as far as India as demonstrated by the Qutb Minar, Delhi, begun in 1202 and completed in the early 14th century.